Do you have a favourite food, something you could eat your own weight in? Mine is mango sticky rice, but my partner Nick, says his is gnocchi. He’s maintained this position for years – and I’ve watched him do it. If I make a kilo of gnocchi, very rarely does any make it to the next day’s lunch. I used to think that it was just Nick that was gnocchi-obsessed but friends are always impressed that I make gnocchi from scratch. I can’t remember the last time I bought a pack of store-bought gnocchi, if ever. It is like pasta in a way – dried pasta is a quick, weeknight meal but fresh pasta is a luxury – reserved for friends, weekends and too much wine. The last time I made gnocchi, I thought I glimpsed just out of the corner of my eye, one of our best friends head down in his bowl. “Did you just lick the plate?” his wife asked. Turn out he did. That’s what real friends are for – and admittedly, that is one of the highest compliments I’ve ever been paid as a chef. If this is your first time, start with a small quantity, maybe just enough for 2-3 people so that you get a feel for the process. 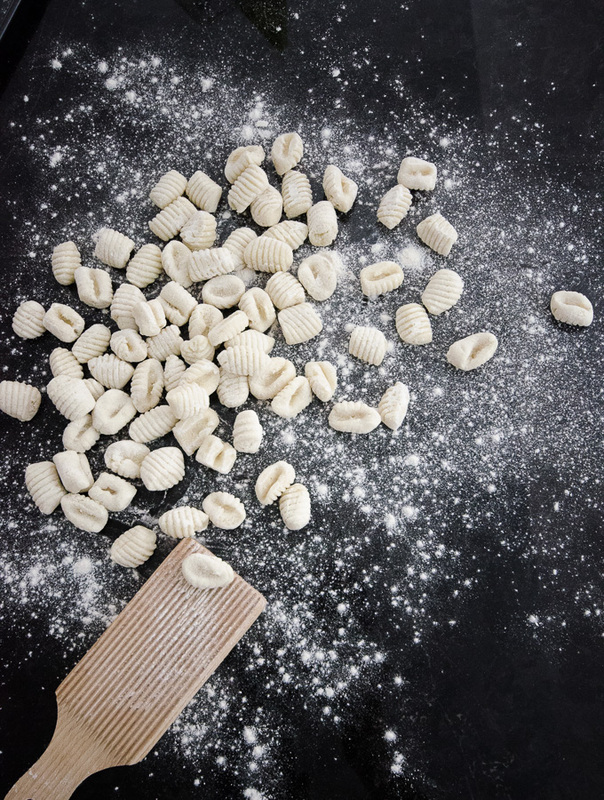 The dough can get tricker to handle when you make bigger quantities which is why gnocchi quality can vary widely at restaurants. There are so many questions that are up for debate with gnocchi – what potatoes to use, whether to boil or roast them, whether to use egg or not, how much flour to use,… for such simple food, love is in the details so some let’s start with some sound research. The most important thing to know in gnocchi making is that the quantities listed are an approximation. The starch content will vary widely between varieties of potato, depending on when they have been harvested and even how long they have sat in your cupboard. The down side is that there is a lot of explaining and no hard and fast recipe. The up side that your gnocchi will improve each time you make it and get a better feel for the dough. It’s about time I put my repertoire of cookbooks to good use, so I consulted Marcella Hazan’s The Essentials of Classic Italian Cooking. Wherever in the world you are, Marcella Hazan is the godmother of Italian cooking – just read this piece from David Sipress. What Julia Child is to French cooking, Marcella Hazan is to Italian cooking. A bit closer to home, I checked in with Stephanie Alexander via her kitchen ‘bible’ The Cook’s Companion. If you’re Australian, the book almost needs no introduction. It was one of the first books gifted to me when I moved here, and contains over 1000 recipes, organised alphabetically. I fell in love with Mietta’s O’Donnell’s book Mietta’s Italian Family Recipes after a housemate declared her pizza dough recipe to be the best he’s ever used. She’s best known for being a pioneer of the Italian food scene in Melbourne (even Stephanie Alexander frequented her restaurant), and although the book is simple, the recipes have a heartwarming authenticity about them. In the era of fancy cookbooks, this one’s strength is it’s simplicity. *As with all regional cooking, Italians have differing opinions on everything. If you prefer your recipes right from the source, here’s one I got right from an Italian nonna in Riomaggiore. If you are are ever there, please pay a visit to Francesco at Enoteca D’uu Scintu and tell him Tash says ‘buongiorno’. What kind of potatoes should I use in gnocchi? The choice of potato is critical, says Marcella Hazan, who recommends Desiree potatoes for making gnocchi. Stephanie Alexander concurs, recommending Desiree, Nicola or Toolangi Delight. Older potatoes are better as they have less moisture in them. It can be hard to know how old a potato is, but rest assured that it is no problem to use potatoes that are sprouting eyes. With varieties of potatoes constantly changing – the humble all-rounder Desiree seems to have disappeared from major supermarkets – it’s best to look for floury or all-purpose potatoes. In in doubt, look on the back label for potatoes that are best for mashing. What is the best way to cook potatoes for gnocchi? Although a lot of newer recipes recommend baking the potatoes to reduce moisture, Stephanie, Mietta and Marcella agree that they should be boiled whole – skins on, in a large pot of water. I did attempt baking potatoes a couple of times, but found the longer cooking time and reduced yield (a thicker layer of potato near the skin dries out) not worth the effort. Choose similarly sized potatoes so that they cook at the same rate – it also reduces the need to test each potato for doneness. Avoid testing the potatoes too often as piercing them with a knife can cause them to become waterlogged. Be careful not to over boil the potatoes as the skins will start to split and the potatoes will become waterlogged. I know, I know this is getting tedious, but I have read one too many articles about people claiming gnocchi failure after putting their potatoes into the food processor or blender. Please don’t do this. 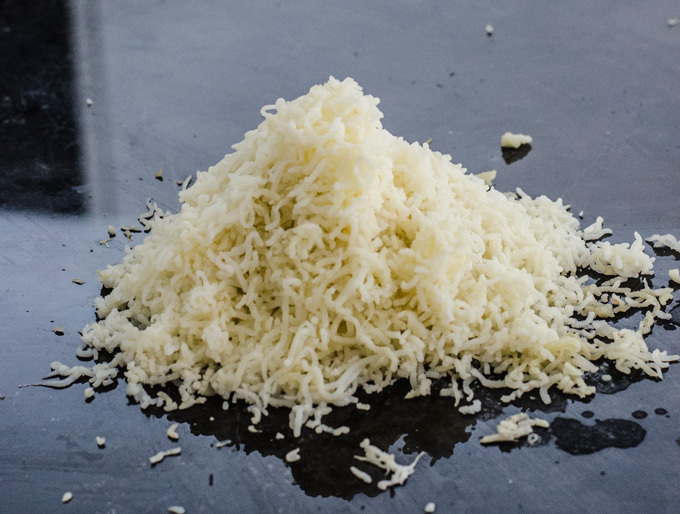 Mashing or even grating potatoes is fine but by far the quickest way is to use a potato ricer where you can put whole, skin-on potatoes through. It took me about 2 years before I realised that I could rice potatoes with their skin on, so I pass this information on to you with the gravitas that it deserves. Go forth and conquer. This is the one I have had for years (mainly because I prefer plastic to metal and there is less risk of it rusting) but any like it will do the job. Most people use a masher which works just fine but I make a fair bit of gnocchi so I appreciate the time saving and I hate peeling cooked potatoes. The potatoes should be mashed, or better still, put through a ricer while still hot. More steam will escape and the gnocchi will be less stodgy. Is there egg in gnocchi? The egg question is a (mostly) easy one. The nonnas are all in agreeance – eggs are a no-no in potato gnocchi. Some people do use eggs because they make the dough easier to handle, but this ‘Paris style’ method results in a tougher, more rubbery product says Marcella Hazan. There’s also the added bonus of it being vegan-friendly if no eggs are used. An egg can result in a more cohesive dough, but I think compromises on the potato flavour somewhat. The decision is yours, I don’t use it, but if you want to use one yolk per 500g of potato, or one egg per kilo. How much flour should I use for gnocchi? The magic ratio rests at roughly 30% flour to potato, by weight. All the recipes I consulted said between 270-320g per kg of potato. The less flour used, the lighter the gnocchi will be but too little and it will start to disintegrate when boiled. Use as little flour as you can to bring the dough together. I normally weigh out 30% of my potato weight (i.e. 300g flour for 1kg potato) into a small bowl, then I add about two thirds of that to the riced potatoes. Add more flour as necessary, until you have used up what is in the bowl. If the dough is still not coming together, add more flour but be gentle about it. The gluten will have started to develop and the gnocchi can start to get a bit heavy. I know that 00 flour is recommended, but I have always used plain flour. Part of this is habit and part of it is that I find no discernible difference. How should I cook gnocchi? Forming the gnocchi isn’t where it ends. How long it takes to cook yout gnocchi will vary depending on the size and composition so it’s quite an important last step to pay attention to – and not quite as simple as chucking it all into boiling water and waiting for it them to float. To cook gnocchi, bring a large pot of water to the boil and salt it so it tastes like the ocean. When boiling, drop in your first batch of 2-3 dozen gnocchi – 10 seconds after they have floated to the surface, drain them and taste. If they are too floury, add 2-3 seconds to the cooking time and if they are too sloppy/disintegrated subtract 2-3 seconds from the cooking time. Use that as a rough guide for the coming batches. What’s the best way to store fresh gnocchi? If you want to freeze extra gnocchi, it is best to do so just after you make them. Spread the gnocchi on a baking sheet, trying not to crowd them too close together, then place in the freezer. When they have frozen solid, place into plastic bags and freeze until using. When cooking these gnocchi, grab them out of the freezer and put them straight into boiling water. They are not quite as magical, but will do in a pinch. I’d say they’re about 85% as good as fresh and 200% better than the rubbery pellets that are labelled gnocchi at grocery stores. Your sauce should be ready before you start cooking the gnocchi. Once they are removed from the water, they will start to stick to each other – if you put them in a colander, they will compact down and can turn into a gluey mess. Aim to scoop them out of the boiling water with a slotted spoon and straight into the waiting sauce. (Some salty gnocchi water will get into your sauce, so it is best to under salt until all the gnocchi has been added). Do not blend, beat or use a food processor to make gnocchi. There are no shortcuts here. (Just repeating because lots of people skim the post). Step-by-step on the next page as I couldn’t quite restrain myself from giving you all the information, this post turned out a bit longer than intended. Wash potatoes and weigh them. Cook potatoes, skin-on in a pot of tap water. Add salt, bring to the boil and cook until done – test with a small knife until the knife easily pierces through the potato. Weigh out 30% of the weight of potatoes, in flour i.e. 200g flour for 600g potatoes. I love my potato ricer because I can just pop the potatoes straight from the pot into the ricer. It’s no biggie if you don’t own one – just peel the potatoes, then mash or grate. 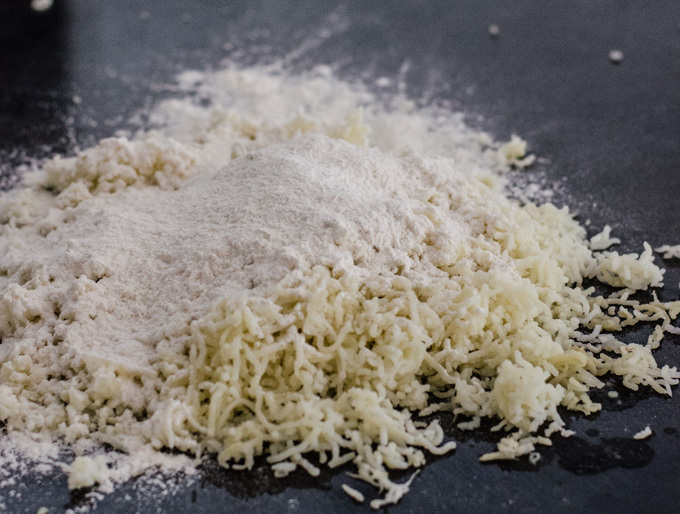 Gnocchi dough is hugely variable due to the starch and moisture content in potatoes, so start by adding two thirds of the flour you weighed out earlier. If the dough is still too sticky to work with, you can add more later. At this point I like to pat it out into a rough rectangle, then cut into even widths before rolling. I love my gnocchi board, but the back of a fork works just as well. Check my Instagram highlights for proof. Put the potatoes, skin on in a large pot of water and bring to the boil. Cook until just tender – avoid testing too often as puncturing them makes them waterlogged. When they are done, drain and mash (or run through a potato ricer) while still hot. If you are using a ricer, you don’t even have to remove the skins. Weigh out flour into a small bowl. 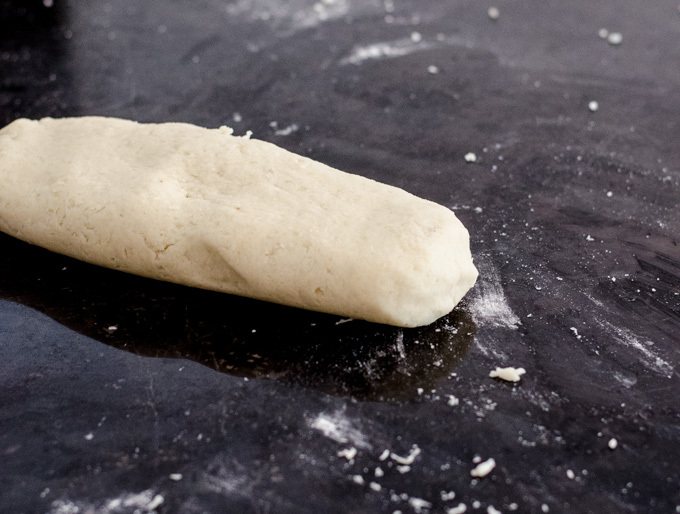 Add two thirds of the flour to the potatoes and knead just until it forms a smooth mixture – do not overwork the dough. Some potatoes absorb less flour than others, so it’s best not to add all the flour until you know exactly how much they will take. Stop adding flour when the dough starts to come together into one solid mass, and the mixture has become soft and smooth, but is still slightly sticky. If you need to, add a bit more flour - but use a gentle touch. Dust the work surface lightly with flour. 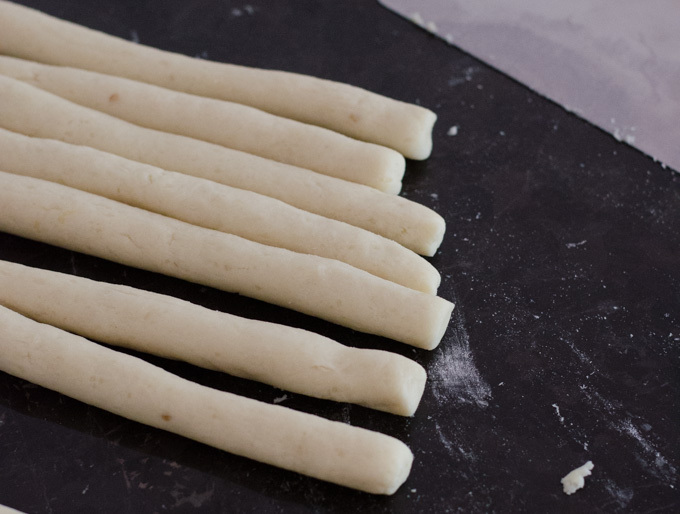 Break off a portion of dough and roll into a long thin sausage shape about 2.5cm thick. Repeat with the rest of the dough. Slice the rolls into 2cm lengths. Holding a fork in one hand (or a gnocchi board if you have one) press each cushion of dough into the fork to make ridge on one side and a finger indent in the other. When gnocchi are shaped in this manner, the middle section is thinner and more tender in cooking, while the ridges become grooves for the sauce to cling to. To cook the gnocchi, bring a big pot of water to the boil, and salt it. When boiling, drop in your first batch of 2-3 dozen gnocchi - 10 seconds after they have floated to the surface, drain them and taste. If they are too floury, add 2-3 seconds to the cooking time and if they are too sloppy/disintegrated/almost dissolved, subtract 2-3 seconds from the cooking time. Use that as a guide for the coming batches. 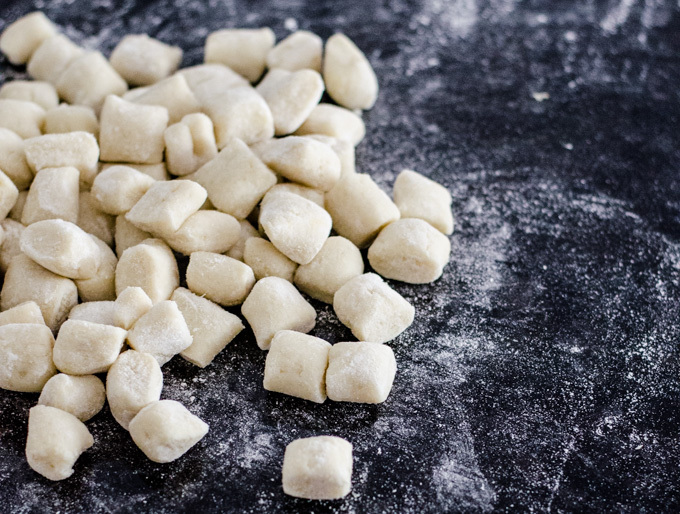 Remove gnocchi from boiling water with a slotted spoon and place straight into the sauce you are going to serve with. Disclaimer: Some of the links contained in this post are affiliate links. If you decide to purchase an item via these links, I get a small percentage from the company – this is at no additional cost to you. 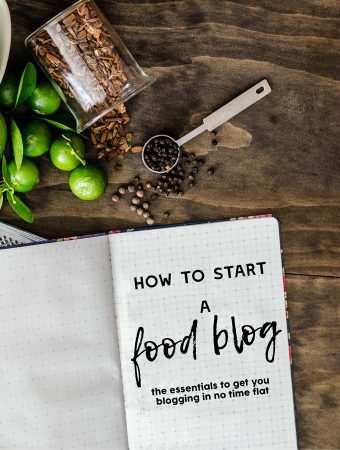 These commissions help me continue to blog great food content. 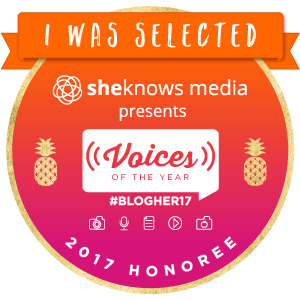 If you don’t want to use the links, that’s totally okay too – no hard feelings.